The more I think about this, the more I am convinced I need to build a pod that can be removed from the trailer, allowing me to use the trailer for utility stuff. That leads me to consider building a bed for the trailer of 5/8 or 3/4 plywood, thoroughly painted with The Mix and then painted underneath with one of the black goos. The pod floor, then, would be 5/8 or 3/4 ply treated with The Mix as well, and bolted on at four to six points when mounted on the trailer. What with two layers of ply then making up the floor, I'm looking at 1 1/4 to 1 1/2 inches of plywood underneath the cabin interior, and cannot see a real need for insulation at this point except in the coldest places -- and I am in the desert. Anyone see any holes in my thinking? I'm not a fan of plywood for a trailer deck for utility usage especially if it will be stored outdoors. I prefer PT 2x material but your plan sounds reasonable and may be the best way to go if weight is a concern. Anyone see any holes in my thinking? 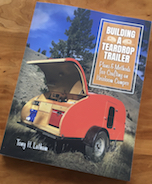 If you need insulation in the floor of a teardrop, your mattress is too thin ––one man's opinion. The Mix is great for sealing out water but you'll still need something to protect the wood from the sun if it will sit outside. A good oil based paint will suffice. Water is going to be drawn through capillary action between the two layers of plywood. Make sure the floor of you "pod" is well sealed and you may want a grid of drain holes in your bottom ply to mitigate. I built 7 or so years ago just like you're considering. My utility trailer has treated plywood 3/4 in thick on it's deck. This is my 2nd treated plywood of this thickness to be on my deck in about 35 years. I always paint it but you wouldn't need to. My unit a TD has plastic skids attached to the bottom to make it easier to slide in and out right on top of the plywood deck. Four or six bolts down through the sheet of plywood are all that hold my TD in place on the utility trailer. Don't take it off as often as I used to now that I have a truck, but still comes off when I have to move something heavy that won't fit in the truck. To each their own. When you don't have much room to park a bunch of trailers, having one multi use is an option. Nothing fancy about my removal or mounting of the TD. I just slide on and off with a couple of come alongs once the unit has been unbolted from the deck unto a frame that I built for this purpose. When I don't need the frame I take it apart and store it in the garage. Takes about an hour to take off or remount. Most of that time is spent taking the mounting bolts off, since they have a tendency to oxidize. A screw gun makes quick work out of assembling my storage frame. Tony, thanks for the thoughts on capillary action and providing for drainage -- and for floor insulation vs. mattress thickness. I am still thinking through what role epoxy might play in my build. Art, I'd like to know more about the plastic skids you used. I was halfway thinking of gluing on some gallon milk jug plastic in a few strategic places on the bottom of the pod to provide just a bit of lubricity. 1/8" X 4' X 8' HDPE sheet for a bottom panel? I like your thinking, sir. I just bolted plastic "deck boards" sold at Lowe's to the bottom of my frame. Nothing fancy, but it works. I probably could have just used 2x4 treated on the bottom but I tend to overbuild. Instead of airplane, I built a tank because of the bending pressures that I thought I'd encounter every time I winched the thing off my trailer. I believe now, I could have just used a foam sandwich with just as much success. to each their own, my unit has served me well over the years and I continue to use it. ae6black wrote: I just bolted plastic "deck boards" sold at Lowe's to the bottom of my frame. Nothing fancy, but it works. I probably could have just used 2x4 treated on the bottom but I tend to overbuild. Instead of airplane, I built a tank because of the bending pressures that I thought I'd encounter every time I winched the thing off my trailer. I believe now, I could have just used a foam sandwich with just as much success. to each their own, my unit has served me well over the years and I continue to use it. I am looking to build a Foamy similar to ScottE's Camp Capsule on a 5x8 TSC landscape trailer and I was thinking along the lines of some type of skids to make a removable pod. How many boards did you use? Those composite boards are mighty expensive, I am not an engineer and trying to figure out how much area to support? I am thinking about building the 'pod' so that it overhangs the trailer a bit, enough to jack it up off of the trailer and then pull the trailer from under the pod and place jack stands in three rows, actually thinking about building a cart, I think I have more than six large 7" casters, thinking about joining them in pairs, and place jacks between the caster and the pod, and then join the 3 jack pairs to make a cart when pod is fully removed, I would use the same TNUTs in the pod to mount to trailer and cart. Here is a scratch pad idea of what I am thinking? I just used a couple of plastic impregnated deck boards that I bought from Lowes. I ended up making a square around the parimeter and then put one down the center for good measure. between the plastic boards and the the base treated 2x 4s that I put my plywood floor of the TD on I hollowed out a space to attach some 1/4 thick metal that I bolted in the sandwich that made up my TD foundation for the floor. The Metal with holes drilled in them stick out enough to attach a false chain link that I can hook a come along to. Not very inventive, but I take this thing off all the time and set the td on a series of 3 or 4 frames that I made out of 2 X 4s and 2x6s. A couple of long runners attached to the top of my frames that stick several feet out the back give me a place to winch the thing off. Don't really know if it helps or not but I generally put the TD wheels up on a board to let gravity assist me when I winch it off. Nothing fancy, it works, the top stringers on my frames stand proud and inch or so to help guide the TD from moving from side to side as I winch it off. Sorry, I never took any pictures. I just winch the thing off when I need the trailer. What takes me the longest time is unfastening the bolts that I put through the TD floor and foundation slides that hold it to the trailer. Half an hour or less once everything is unattached. Living in some one else's house and already having a travel trailer and the utility trailer that my TD sits on are trailers enough for me to worry about finding space for. ae6black wrote: I just used a couple of plastic impregnated deck boards that I bought from Lowes. I ended up making a square around the parimeter and then put one down the center for good measure. between the plastic boards and the the base treated 2x 4s that I put my plywood floor of the TD on I hollowed out a space to attach some 1/4 thick metal that I bolted in the sandwich that made up my TD foundation for the floor. The Metal with holes drilled in them stick out enough to attach a false chain link that I can hook a come along to. Not very inventive, but I take this thing off all the time and set the td on a series of 3 or 4 frames that I made out of 2 X 4s and 2x6s. A couple of long runners attached to the top of my frames that stick several feet out the back give me a place to winch the thing off. Don't really know if it helps or not but I generally put the TD wheels up on a board to let gravity assist me when I winch it off. Nothing fancy, it works, the top stringers on my frames stand proud and inch or so to help guide the TD from moving from side to side as I winch it off. Sorry, I never took any pictures. I just winch the thing off when I need the trailer. What takes me the longest time is unfastening the bolts that I put through the TD floor and foundation slides that hold it to the trailer. Half an hour or less once everything is unattached. Living in some one else's house and already having a travel trailer and the utility trailer that my TD sits on are trailers enough for me to worry about finding space for. How big is that piece of metal you are using? is it like a tab, something like 6" or 12" of 1/4" flat bar inlaid on each side of the rear end of your 'pod'? Or did you extend the length of the flat bar the whole length front to back of your trailer between the plywood floor and those 2x4's? And how much do you think your pod weighs? And got it, you put the pod a little higher than your frame on the ground to prepare for winching it off. I talked to my insurance guy about doing this, more for getting a life time utility plate over having to buy RV plates yearly. He said not a good idea. First the law is clear in AZ if you can sleep in it (bed) it's a RV. Needs RV plates. Chances of getting pulled over for it are probably slim. But if you do you'll probably end up with a ticket and court date. Then you need to sell it to a judge that you are hauling a camper in your utility trailer. The other thing was with the insurance company if you had a claim. He said just know if you do it there could be a lot on headaches down the road. 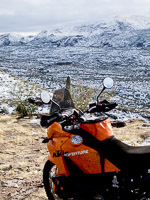 KTM_Guy wrote: I talked to my insurance guy about doing this, more for getting a life time utility plate over having to buy RV plates yearly. this is why mine is being built as an enclosed with windows. Because I'll be hauling my mountain bikes in it for trips. Since the "bed" is nothing more than some form of matress on the floor it stays as a utility trailer. In TN, less than a certain length, no matter what used for...even my boat trailer....only thing a trailer needs is air in the tires and working lights, no title, no registration, no nuthin....crazy stuff....even my 6x12 box trailer.....not needed....but, I have mine as it does make it easier to sell to someone who is out of state....TN has us print off a page from their website with the state law, to carry on out of state trips.....paraphrasing.....this won't stop an out of state cop from giving you a ticket for no lic plate.....but, you win in court. funny thing is that technically an officer can be reprimanded for issuing such a ticket as it's technically illegal. If your vehicle meets your home states laws, states you visit can stop you but if you prove on site that you are in compliance with your home state laws, legally they are required to let you leave without a ticket. Rarely if ever is that truly challenged as most cant afford the time to got back to said state to appear in court so they pay the ticket. Thus boosting revenue for state/county/city. I have done it before when I had to deal with a new county officer thinking he was high and mighty. Got pissed when I turned around and called county dispatch requesting the commanding officer for the shift. It's a federal law. Just like states have to honor any court orders issued in another state. Yeap I like to push those issues cause I dont tolerate officers being douchebags, especially with the number of area officers I grew up with and so on. I know better so I show respect but use my rights if one starts being rediculous.